If you think about it, it is absurd that spaceship designs are very long 99% of the time and in the worst case, not very high or wide. It is logical that people have associations with naval ships and aeroplanes, even contemporary spacecraft – but even the latter are designed as they are because they need to launch into space through atmosphere. It is 2018 and it is about time we start living in the future and open our minds to more ways to think of a spaceship – like this vertical design by Daniel Church. Besides the obvious main feature of the unique vertical design, I love the translucent sections, from the gently curved lines spanning across the whole spacecraft. to the three hollow hexagonal constructions. The blue is balanced by larger less detailed sections of gray and black. If you do not look at it closely enough, you just might miss the grilled ends at the top and bottom, which look great and finish off the creation beautifully. 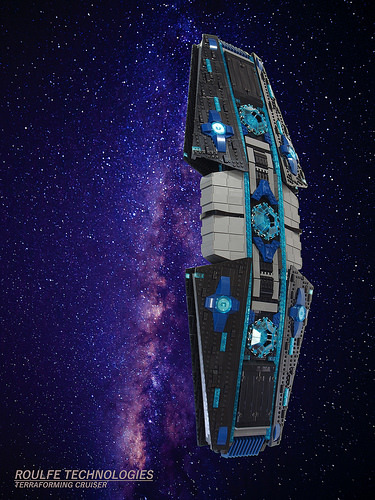 The builder also reveals that photography was a great challenge; so great in fact, that even though the spaceship was built and completed for the SHIPtember project four months ago, but the pictures were only done recently. Well worth the wait, if you ask me! It’s not really that absurd considering you are much more likely to run into debris in the direction of travel, especially when at speed, rather than have debris intersect you from an angle – the smaller cross section you can expose, the less you have to armour from frontal strikes and the less chance there is of a strike in the first place. But then, this is LEGO, ignore anything but your wildest dreams ?